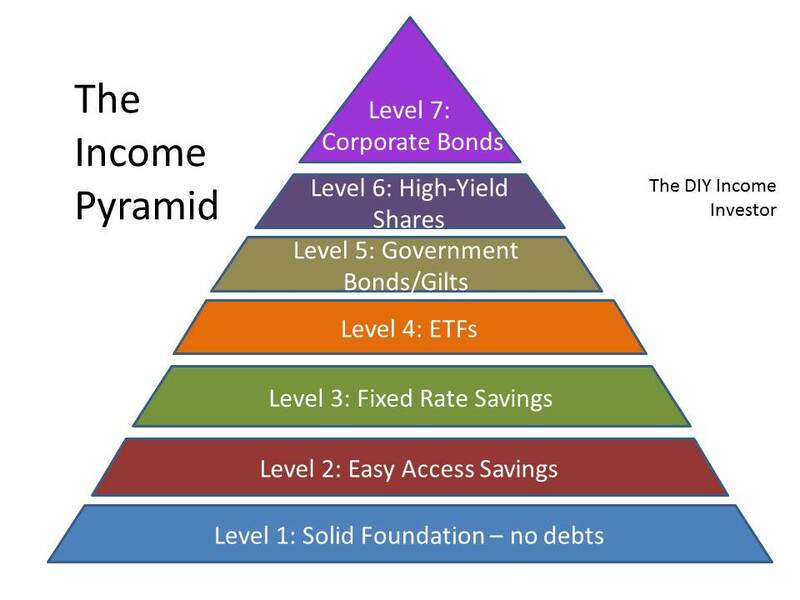 Developing the theme of the The DIY Income Investor, we continue building up your Income Pyramid by moving up to Level 4 - buying an Exchange Traded Fund (ETF), preferably within a tax-shielded Internet brokerage account. 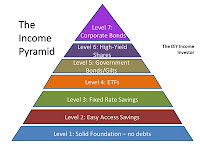 Level 3 was all about fixed-rate bank accounts or 'savings bonds' as they are called in the UK. The answer is: to reduce risk, particularly if you are new to the stock market and the 'ins and outs' of buying shares, government bonds/gilts or corporate bonds. ETFs are a collective investment - the fund is based on a collection of assets of a similar type, so a major problem with one particular company or asset should not cause a catastrophic loss. The downside is that returns are lower than you might make with the 'best' example of that asset class - but then that 'best' example might go bust! There is another risk - the market risk associated with a particular asset class. In other words, the resale value of your ETF purchase may go down. It may also go up. If you focus on the income, this fluctuation in the value of the fund is less important - you can wait for the market to (hopefully) recover. So there is still some risk - but much, much less than if you own individual assets (e.g. shares corporate bonds). Get the hang of ETFs - watch the 'ups and downs' of the markets - for a couple of years; maybe do some 'virtual trading' (i.e. without real money) to see how particular investments work out. Look on this time as a useful apprenticeship. Ignore this advice and you will (probably) lose money. See the This is Money article on ETFs for an ISA. ETFs will on average provide a more diversified, better performing, lower cost fund than the average mutual fund. Much of this is due to the huge cost savings of an ETF over a mutual fund. For example, a broad UK All-Share tracker ETF will typically have an expense ratio of 0.4% per annum compared with 1.7% for an average mutual fund. On top of this, there are no front end costs (which can be up to 5% for many mutual funds), and the 'hidden' dealing costs are minimal (in an average mutual fund, it is not unusual for the annual turnover to be 100% or more per year, incurring significant dealing costs which can impose additional costs of over 1% per annum). Of course you will not find many financial advisors telling you about ETFs - as these do not pay commission to intermediaries. In fact, the fund management industry is very worried about the competitive threat that ETFs present. I have identified elsewhere suitable ETFs on the UK market.